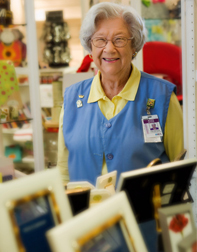 Batson, of Cary, has been a volunteer in the Rex Healthcare Gift Shop for nearly 12 years and has volunteered more than 3,500 hours during that time. What started out as helping a friend put together plant arrangements has blossomed into a fulfilling volunteer position. “Initially I just helped a friend who put together plants for the gift shop,” said Batson. “But then I thought I might like to do it on a regular basis.” And so every Friday, Batson mans the gift shop register at the hospital and offers a friendly face to anyone who enters. Batson was a CPA and retired in the late 1990s. As she describes it, she had been working “forever,” and once she retired, and her four children had left to raise families of their own, she needed something else to fill her days. Part of the job that appealed to Batson was being able to interact with the customers. And her favorite customers that come into the shop? The new grandparents. “The new fathers are wonderful to work with, too,” she added. 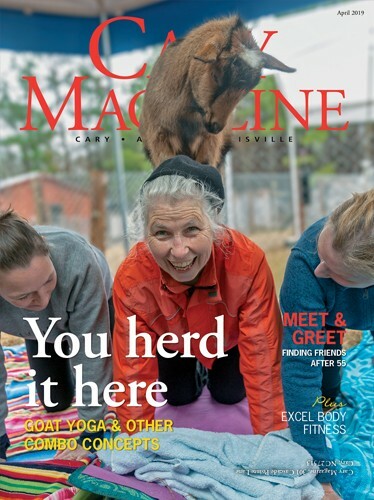 In addition to her volunteer work, she is active in her church, First United Methodist Church of Cary, and is a volunteer with the Pilot Club of Cary, a civic organization that focuses on brain-related injuries and disorders. She has been a volunteer with the Pilot Club for 25 years and currently helps by replacing batteries in the bracelets of people in its Lifesaver program. The Lifesaver program is run in conjunction with the Wake County Sheriff’s Department and provides patients with brain injuries and disorders who have been labeled as wanderers with bracelets to track them. Her volunteer work keeps her busy, but that’s the way she likes it. And perhaps it’s this dedicated side of her personality that makes her a valuable volunteer. But Batson added that anyone can be a good volunteer. “Anyone who comes in to apply to be a volunteer has the ability to do so,” she said. “As long as the desire is there, volunteer work takes all types. The common thread among all of us is the desire to help.